Five months ago they launched a little public access show in Newton, teaching kids to draw. How did it get picked up across the country? NEWTON — Mark Marderosian and Robert Palmer Jr. were tickled when the operators of Newton’s public access cable channel agreed to air “Drawing With Mark,’’ a simple, old-fashioned TV show they created that teaches kids how to draw. They never imagined — even as they worked vigorously to promote the show — that interest would snowball so quickly that as of today, less than five months after the first episode, “Drawing With Mark’’ has been picked up by 105 cable-access channels that serve around 150 cities and towns in 25 states, including Florida, Texas, California, New Jersey, and Michigan. Providing their program free of charge to stations that are hungry for children’s programming, they have created their own ad-hoc version of a national syndication network. The unusual strategy means that at a time when the proliferation of channels has made it harder for TV programs to build an audience, their quiet little show is garnering prime space on many cable systems, including the slot most coveted by producers of children’s programs: Saturday morning. The rapid success of “Drawing With Mark’’ also opens a revealing window onto the world of public access television, and underscores how blurry the lines between commercial and noncommercial have become in a medium launched four decades ago as a forum for free speech. In 1972, the Federal Communications Commission mandated that cable operators give citizens free access to at least one channel in each community to increase participation in political and civic life. These channels are not subject to regulation by the FCC or cable providers; the power to approve programming rests with the local entities that run the channels. Advertising is prohibited on the channels, though shows can be sponsored by local businesses. 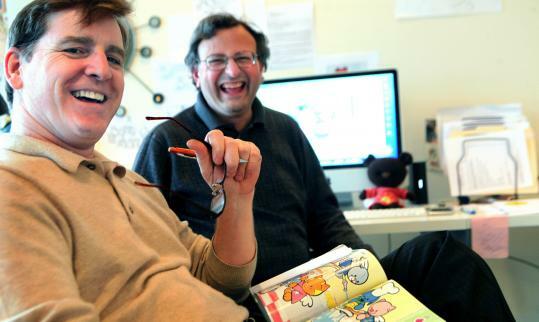 Marderosian, a veteran illustrator, and Palmer, a designer and animator, run a small children’s media company, Big City Publishing, which sells storybooks, coloring books, flash cards, and puzzles. The products are built around the “Angels From the Attic,’’ which are winged, round-faced bunnies and kittens created by Marderosian. The “Angels’’ are prominently featured in “Drawing With Mark,’’ which is hosted by Marderosian. There is no advertising on the show, and Marderosian does not urge viewers to buy anything, but the address for the company website is shown at the end of each episode. Marderosian maintains that the TV show was not created as a marketing tool but as a way to communicate a message to kids about the importance of drawing, dreaming, and creativity. “We are very careful. There is no specific call to buy in the show,’’ he said. “We want to provide [children] with programming that is wholesome.’’ He noted that the website does not contain products for sale but rather drawings that youngsters can download and color in. Robert Carbone, executive director of North Reading Cable Access and Media, said he has refused to allow certain shows on the air because they were clearly ads masquerading as programs, but he accepted “Drawing With Mark’’ because it does not fit in that category. “I’m sure the money he makes helps pay for his own program, but as long as its not an in-your-face kind of ad, that’s fine,’’ Carbone said. The seeds for “Drawing With Mark’’ were planted last year, when Marderosian and Palmer took lessons at NewTV, the public access station in Newton. Over the winter, with Palmer directing, they filmed the first “Drawing With Mark’’ at NewTV. A staffer suggested that other communities might be interested in airing the show, so Marderosian and Palmer started e-mailing station directors. Waltham immediately agreed to air “Drawing With Mark.’’ Next came Needham, Shrewsbury, and Dedham. They started branching out beyond state borders, and were startled by the eager reception they got. Although Marderosian was a full-time freelancer for Disney for 15 years, creating illustrations that were used in coloring books, picture books, and theme-park merchandise, he said that because he wants to maintain creative control, he has no desire for “Drawing With Mark’’ to be bought by Disney or Nickelodeon or PBS or any other big media entity.